My crazy good fried chicken recipe! I lovvvvvvveeeeeeeeee me some fried chicken… I’ve made it a ton of times, using a lot of different marinade and dredge mixtures, but this one takes the cake. Trust me, you’re going to love it. You’ll need to marinade the chicken for at least two hours, but ideally it’s best to allow it to marinade for 24 hours to really let the flavor seep into the chicken. In a large Ziploc bag combine the marinade ingredients and add your chicken. Remove as much air from the bag as possible and seal it. Put the bag in a large bowl (in case it springs a leak, you don’t want it all over your fridge… been there done that) and refrigerate for 2-24 hours. Ok, so you’ve marinated your chicken, let’s get ready to cook. Remove the chicken from the refrigerator, allow to sit at room temperature for 20 minutes before you start to coat and cook. In a very large bowl, combine your dry ingredients. Remove your chicken pieces from the marinade and shake off excess liquid, and place in the flour mixture, coating thoroughly. Leave the chicken in the mixture for 15-20 minutes, tossing periodically.. This will allow the coating to really adhere to the chicken. While the chicken is resting in the flour you can get your fry oil ready. Heat your oil in a medium-to-large sauce pot at medium high heat. Ideally you want the oil temp to be 350F. If you don’t have a thermometer you can check the temp by sprinkling a little flour into the oil. If it bubbles and disintegrates on contact you’re ready. If at any point your oil starts to smoke, it is too hot. Set up a large plate lined with paper towels. Set up a baking sheet lined with wax or parchment paper. Important note… DO NOT PUT ALL OF YOUR CHICKEN IN THE OIL AT ONE TIME!!! Multiple bad things will happen. First and foremost your oil temp will drop leaving you with a soggy greasy mess. Secondly, the chicken will stick together and when you try to separate the pieces the coating will come off. It’s time consuming, but you’ll want to cook the chicken one or two pieces at a time, depending on the size pot you’re using. I personally do two at a time. Gently place your chicken into the oil. The oil should immediately start to boil on top, if it does not then your oil isn’t hot enough, and the result will be oily soggy chicken. Fry the chicken until golden brown, about five minutes. Using a slotted spoon (don’t use tongs, you could rip the coating off the chicken) remove the chicken from the oil and place on the towel lined plate to drain off any excess oil. Once you’ve fried and drained all of your chicken, place the pieces on the baking sheet and cook in the oven for 25-30 minutes, depending on the thickness of your chicken pieces. Serve with your favorite side or dipping sauce, as well as a kickass adult beverage, and enjoy! 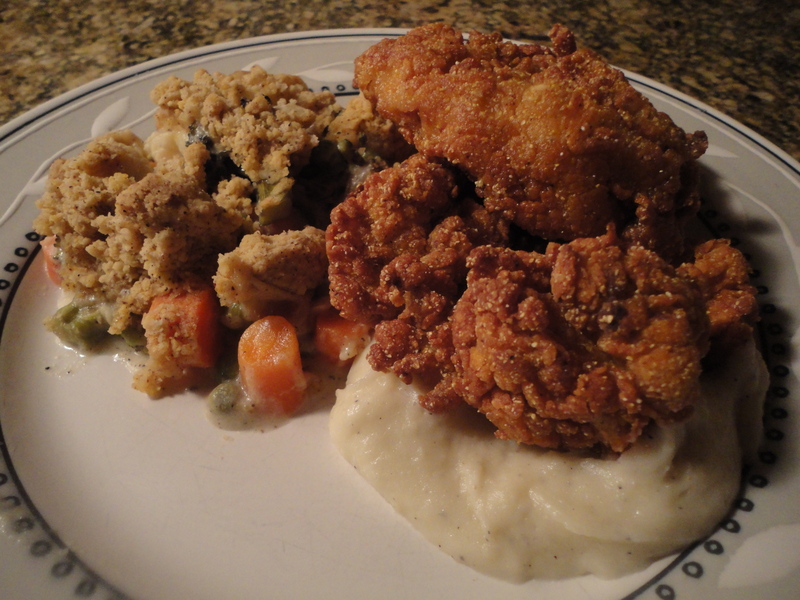 Tags: cornmeal fried chicken, double dredged fried chicken, fried chicken. Bookmark the permalink. I can’t wait to try this recipe. I love how you now have a few related recipes under your post too!